President Obama talks about his relationship with Congress, his recent executive actions on immigration and Cuba, race in the U.S., and foreign policy. In a year-end conversation with NPR News, President Obama told Inskeep that low morale around race relations in the U.S. is exaggerated by the national conversation around recent violence and not an accurate reflection of the state of affairs around the country. When asked if the U.S. is more racially divided than it was when he took office six years ago, the President responded: "No, I actually think that it's probably in its day-to-day interactions less racially divided." 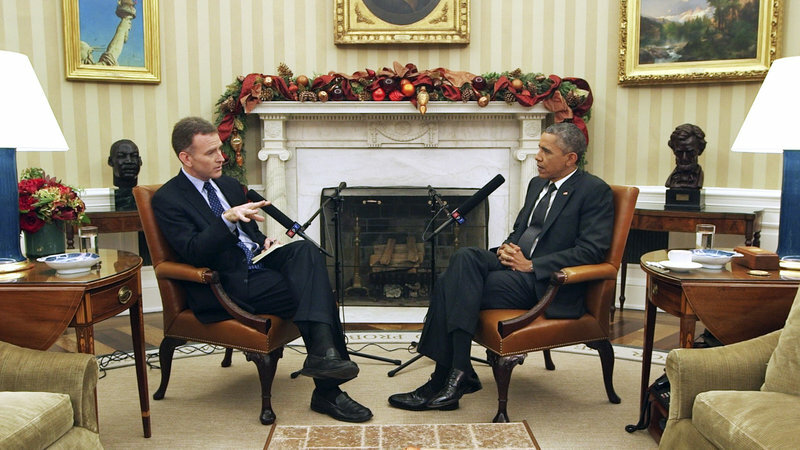 The interview, NPR's first on-camera conversation with President Obama, will be available across NPR's digital and broadcast platforms starting Monday, December 29, 2014. Morning Edition will broadcast the interview in three installments, airing daily from 12/29-12/31 on AM 1370 and WRUR-FM 88.5, with video segments and additional reporting available at NPR.org through the week. Inskeep spoke with the President on-camera in the Oval Office just before he left D.C. for the holidays. During the conversation, the President also discussed his recent executive actions on immigration and Cuba, foreign policy, health care and his relationship with the Legislative Branch. When asked about working with the next Congress, he said: "Now you've got Republicans in a position where it's not enough for them simply to grind the wheels of Congress to a halt and then blame me."